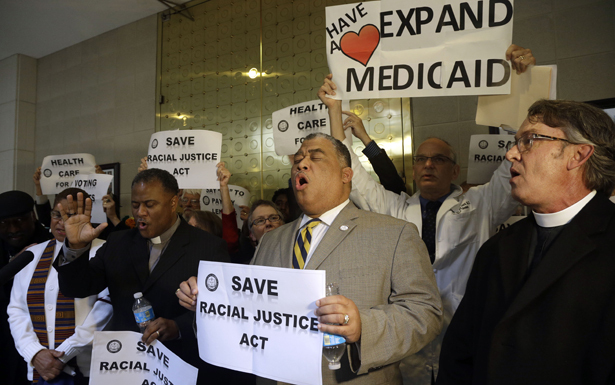 Protestors sing outside of the House and Senate chambers during a demonstration at the Legislative Building in Raleigh, North Carolina, Monday, May 6, 2013. Monday’s protest was the fifth of what NAACP organizers are calling Moral Mondays, which take aim at the state’s assault on voting rights, healthcare, unemployment insurance, public schools and so much more. Protesters came to Raleigh on Monday with a long list of grievances, beginning with measures the legislature passed early in the session to restrict early voting and registration. Protesters worry about cuts in unemployment insurance, the refusal to expand Medicaid to half a million through the federal Affordable Care Act, cuts in public school spending and a recent tax proposal that favors the wealthy. So far, Moral Mondays have attracted a diverse coalition of protesters. In one van this Monday there were two ministers, one black one white, in the front seat; behind them a retired hotel chef and a former public-health researcher; in the next row, retired school teacher Dickinson and a retiree from Volvo trucks; and taking up the rear a 20-something former campaign worker for Obama, a friend, new to politics, and a local Hispanic rights activist. The first stop, two hours later, was the Martin Street Baptist Church, the staging ground for the weekly protests. The sanctuary was already full with the sounds of spirituals and preaching by the time the contingent from Winston-Salem arrived. “Neighbor, if they think they had a fight four weeks ago, they ain’t seen nothing yet,” the Rev. William Barber, president of the North Carolina NAACP, was saying in a rallying call that took the audience all the way back to the book of Isaiah, through the South’s reconstruction and on to the politics of today. Barber, a North Carolina native, spent the last week of May touring the state to build support for the rallies, which began April 29, when seventeen protesters were arrested in the rotunda of the Legislative Building, charged with second-degree trespassing, failure to disperse and violation of building rules. Inside Martin Street Baptist, the preaching shifted to hard-nosed organizing. Altogether, 158 had already been arrested, and about 150 sat in pews ready for instruction in civil disobedience. Lawyers for the NAACP had them fill out orange forms with their names, address and the phone number of someone who could post bond; they promised to be waiting for them at the Raleigh jail. Protesters ready for arrest lined up two-by-two to march into the Legislative Building. “Okay, let’s do it,” Barber said, leading the way to the rotunda outside senate and house chambers, where they stood in a circle around the fountain, singing and preaching, with observers watching from the balcony above. Raleigh police gave a final five-minute warning to disperse and began arresting protesters a little after 6:30. They bound their wrists with plastic cuffs, took them to the basement cafeteria and then loaded them onto buses to the Raleigh jail. Some were released as early as 8:30 that evening but others were in custody until 5 the next morning. Five ministers and a university professor from Winston-Salem were arrested. The rest of the Winston-Salem contingent headed home. Back on the van, Carver thought about the contrast between the crowd outside the Legislative Building and her neighbor who stopped speaking to her last year after she pasted an Obama bumper sticker on her car.